1 - 5 $39.94 ea. 6 - 11 $38.92 ea. 12 - 23 $37.94 ea. These round style Static Wick Covers are our lower priced alternative to Static Wick Markers. 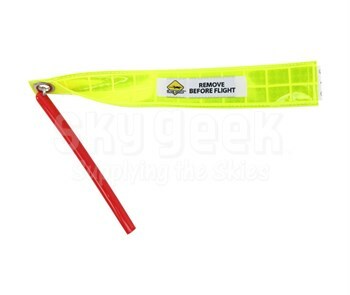 They protect Chelton 2-66SC1Y & Dayton-Granger 16920 + many other static wicks from damage on the ground and make wing/elevator tips more obvious, preventing hangar rash. Two styles are available to fit just about every corporate jet. Slide these round style covers on for a tight weather resistant fit on Citations and other jets. We're the only ones in the industry that offer round static wick covers in a 7" length. Comes in a package of 3.